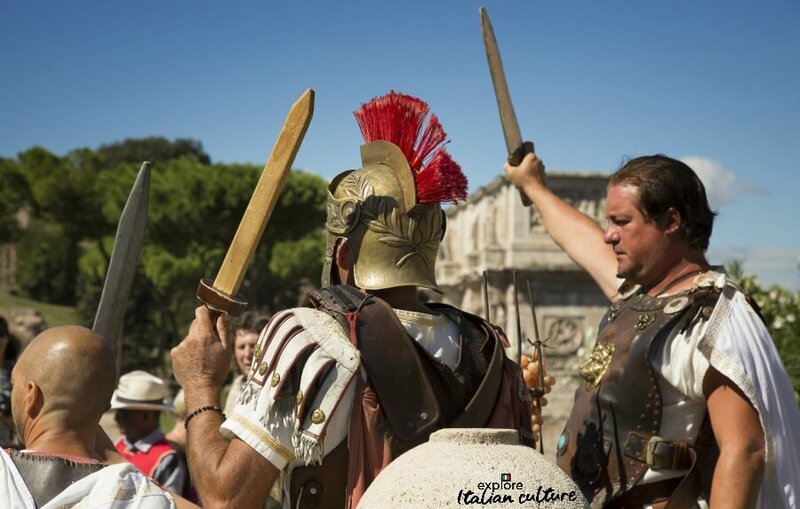 6 facts about Rome you need to know in order to survive it. 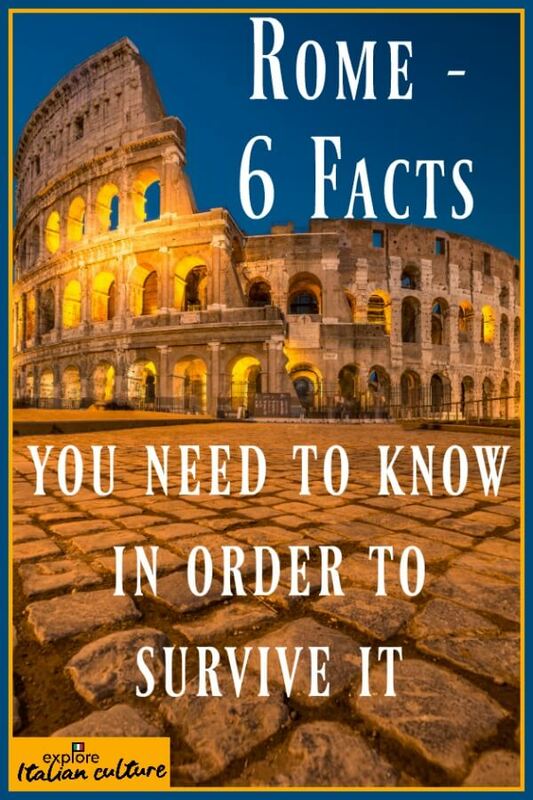 6 essential facts about Rome you need to know in order to survive it. The Eternal City is truly an amazing place, and you'll have a fabulous time there - as long as you're aware of what to look out for and plan accordingly. Let's make this very clear from the start: Rome is no more dangerous or criminal than any other major city. It simply demands some basic precautions be taken and some simple common sense applied - as you would do travelling to any city. We're so used to the city that when Cath's brother and family travelled there for the first time and told us about some experiences they found difficult, we were surprised they hadn't known about these facts in advance. Then we realised we made an assumption that everyone would know. Which, of course, they don't. Nor did we, the first couple of times we went. And we also realised then that we should warn you about how to manage them, too. 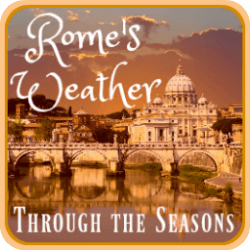 So, with thanks to Will, Julie and William for the "heads-up", here are 6 essential facts it will help you to know about and prepare for - before your visit to Rome even begins. Fact: Rome taxi drivers are magicians. Because they can make money disappear. Your money. Without you even noticing - until it's too late. A favourite trick is to drive off with your change. It happened to us the first time we ever got a taxi in Rome - and we had given the driver €100. We did not have any smaller notes. It happened to my brother, too. Not such a large amount, but the same experience - the driver drove off once he had notes in his hand. Of course, not all taxi drivers in Rome are waiting to rip you off. But better be safe than sorry. If you must get a taxi, think ahead. Take coins and small notes with you, and don't be afraid to spend time counting it out. The driver may not like it, but there's no law that says you need to rush and give him a large note. Coins are legal tender, too! 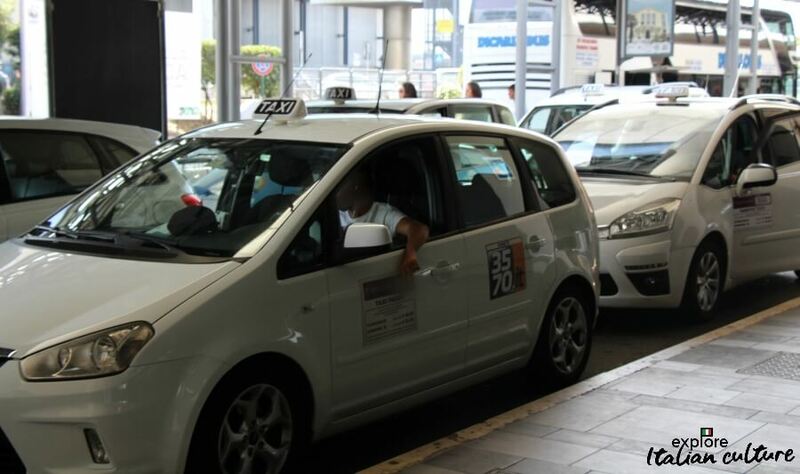 Check the cost before getting into the cab - even when the amount is written on the side of the car (as it is when travelling from Ciampino or Fiumicino airport. Otherwise at your destination you may find the driver telling you that you're in a different "zone" than the one covered by the written cost - or that the cost is per person. It's not. It's per cab. Pay while still in the car and wait for your change there. Don't get out of the cab until you have it. If the driver indicates you should get out while he counts change - don't. Be polite, but firm. Consider alternatives to taxis such as pre-booking private transport to and from the airports. 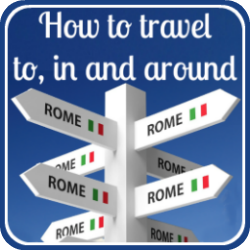 It's much less expensive than you might think, you pay in advance so there's no money involved unless you choose to give a tip, and you're taken safely door to door by a driver who chances are will give you a guided tour of Rome on the way! 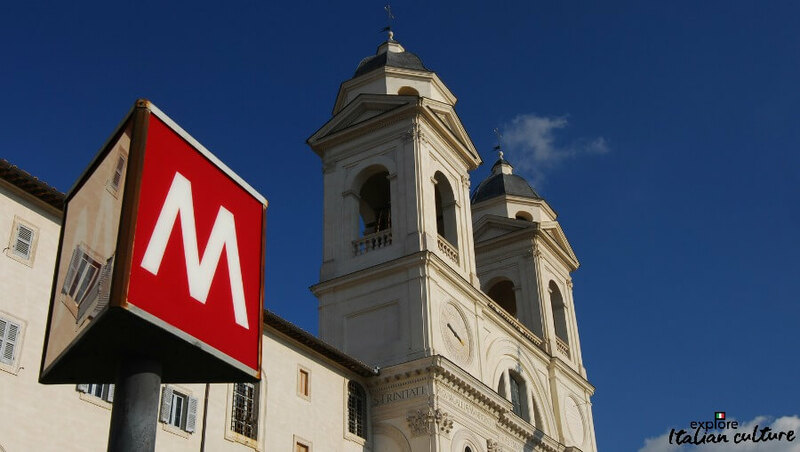 Fact: using public transport in Rome can be expensive. And no, we don't mean the cost of tickets. Public transport in Rome can be a pretty unpleasant experience. It's hot, especially in summer, it's crowded - and it's a favourite place for pickpockets. They will often work in "gangs" or groups, one person distracting by begging, selling flowers, singing or making some kind of "scene", while the others take money from purses, wallets and pockets. Buses and trams are less of a risk than the Metro - there's less opportunity to get off quickly - but you need to be vigilant and exercise some basic common sense whichever you're taking. Don't, please, don't carry wads of notes in your back pocket as a friend of ours did. He had €300 stolen from his trousers on the Rome Metro and was surprised about it! Use a wallet or a secure neck pouch, and carry it in front of you or underneath your clothes. Something like this is ideal - it blocks card readers as well as protecting your money and passport and is designed not to show obviously under your clothes. And it's non-itchy, which in the heat of Rome is a definite bonus! Don't let yourself get distracted by anything on the Metro. And do not, under any circumstances, open your purse and allow a stranger to "pick coins because you don't understand the currency". They're adept at seeming to take a €2 coin whilst at the same time removing notes from your wallet. And yes, this has happened to Cath at a point before she understood what was happening. Rome is actually a fairly compact city. Walking is much more fun than taking the hot, noisy, sweaty underground or bus anyway. Get some exercise and see parts of Rome you'd never see otherwise, instead! Fact: you don't need help to choose your train ticket. 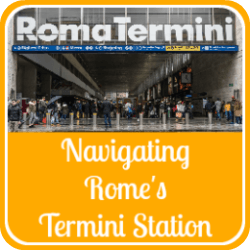 You've arrived at Termini station from your hotel and you need a ticket back to Fiumicino. A kind gentleman helps you work out the (not very complicated) ticket machine. 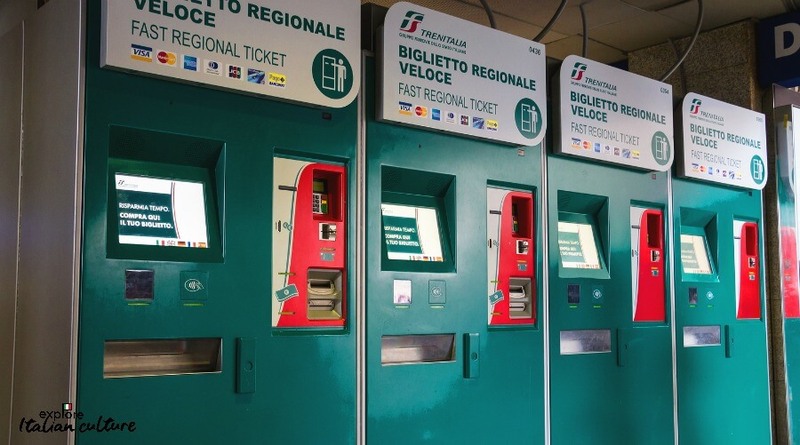 The multi-lingual, easy-to-use ticket machines at Rome's Termini station. No help required! Working out how the ticket machine operates is not hard. They offer different languages, and you should follow the instructions just like you would in your home town. Take your time. There's no rush. It's always hard in an unknown place - especially a place like Termini which is always busy - to keep your nerve. But you can do it. If someone does approach you, a firm "no, grazie" and ignoring their attempts to take your money is usually enough to send them on their way. If it's not, look around and mutter "polizia" (pol-ee-tsee-ya"). This is an illegal activity, and the police are very keen to stop it. Chancers know that and will likely leave you alone. If they don't? Shout "polizia" more loudly. Be polite, but firm. Fact: Rome's drivers see pedestrian crossings as a nice pattern on the road. 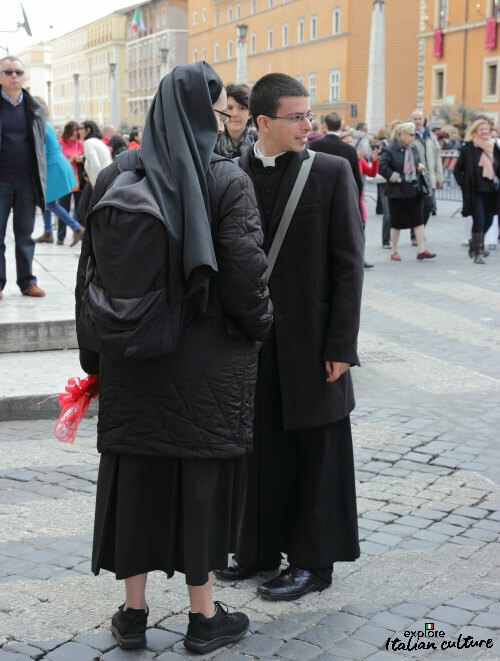 When crossing Rome's roads, always find a priest or nun - or both! Seriously - if driving in Rome is a nightmare (and trust us - it is! ), being a pedestrian comes a close second. Remember: this is a large, working capital city and, although it enjoys its tourists, life in the business sector has to carry on at the same time. And that includes people needing to get places - fast. Pedestrians become a nuisance, and Roman cars travel at speed and do not obey the same rules of the road you may be used to in your home town. One of the most amazing experiences in Rome is being in a car with someone who knows what they're doing and where they're going. If you need to get back to the airport, try hiring a private driver and you'll see what we mean! Your hotel will book one for you, or pre-book in advance with our trusted partner, Viator. Never, never assume that cars will stop either for traffic lights or for a pedestrian crossing. Wait till there's a gap in the traffic before you attempt to cross. Probably the best piece of advice we were ever given - by a native Roman - was to find a priest or nun who's crossing, and tag along. Italians will be far more vigilant about potentially killing a member of the clergy than caring about ordinary members of the public! Fact: Hawkers need to earn a living - and you're providing it. Again, this happens in most cities in the world - some more than others. And Rome is definitely one of the "some". "Gladiators" lie in wait for unsuspecting tourists outside the Colosseum in Rome - they'll charge around €10 a time for photos! It can be a real damper on your visit to a wonderful city, if you let it. Make sure you don't need them! Plan ahead. Never leave booking your hotel until you arrive. Choose carefully, at your leisure in your own home. People selling hotels on the streets are never going to take you to an upmarket place. Take your own water bottle. 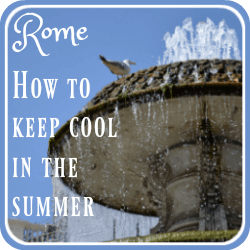 You'll need to keep it empty to go through airport security, of course, but as soon as you get into Rome, use one of the many street fountains to fill it. The water is icy cool, mountain fresh and completely safe. Find out more, here. Pack a travel umbrella. Those you can buy from street vendors won't last two minutes if the wind gets up, and buying a decent one from a store in Rome will cost. Something like this is ideal. It weighs under 1lb and has a large canopy yet folds down small. (Cath uses this one). Pack a cotton or silk scarf. They're lightweight in your luggage, stop shoulders getting burned in the heat and act as shoulder cover should you want to go inside any religious buildings, where shoulders must always be covered. Something like this is very light, stylish and has the added benefit of protecting from the sun. It's very much the kind of scarf you'll see Italian women wearing in Rome - so you'll look very at home. And if you are accosted by hawkers, a polite but firm "No, grazie" should be enough. If it's not, stop walking, face the person and say "Leave me alone" (or similar) in your own language, speaking fairly loudly. Casual vendors are not licensed and they won't want to catch the attention of police. Fact: Cobbled streets and heels do not go well together. The ancient Romans never wore heels, and there's a good reason for that. Cobbled streets and heels do not mix. Quite apart from getting heels caught in between the stones and shoes ruined, you really do need comfortable shoes to do Rome justice. You'll be doing a lot of walking, and you need to do it in comfort. 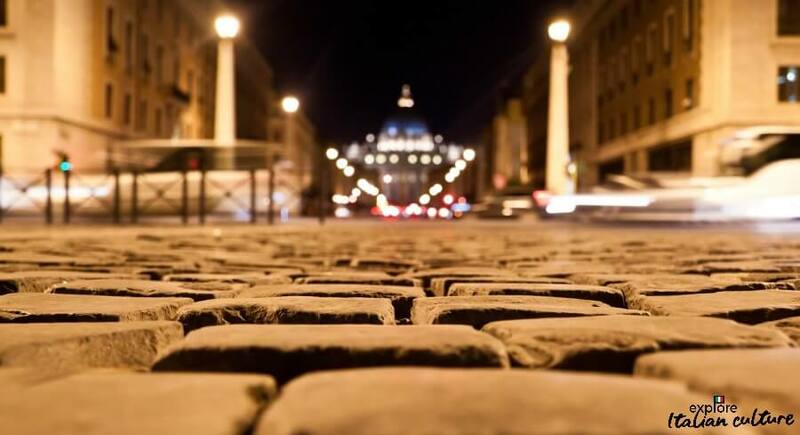 Both main roads like this one leading to St Peter's and smaller side streets are heavily cobbled. Heels beware! You're in Rome, so of course you'll want to look at least respectable, if not elegant. Try not to look like the classic tourist, while keeping comfortable. Walking shoes are ideal if you know you're going to have a long day's trek. If you're a woman, wear a long dress or skirt to hide the fact that those heels have remained firmly in the cupboard. Cath uses a sandal which is ultra-comfortable but still has enough style to be worn with a shorter dress. These are they - they're expensive, but Cath's last a good three or four years, even with the hammering they get in Rome. (Cath's currently on her fifth pair!). Please remember: Rome is a beautiful city, and you'll have a wonderful time visiting its many stunning monuments and features. It is no more dangerous than any other large city - and a good deal less so than most. It will only become a problem if you don't plan properly, and don't exercise common sense precautions. Be aware, think about where you carry your money and other valuables like your passport and iPhone, walk as though you know where you're going - even if you don't! - and you'll be absolutely fine. Some other articles you might like - click the buttons.